AT first glance, it looks as though the group of young adults is building Lego. 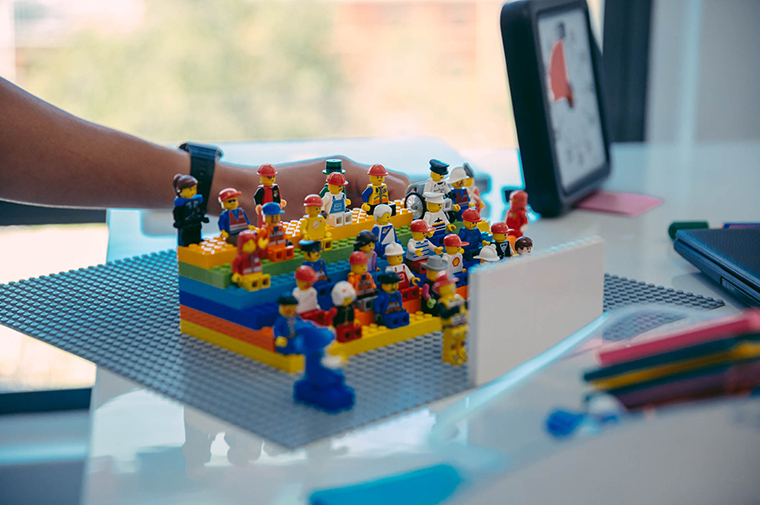 But these are actually students at the University of Cape Town's Hasso Plattner Institute of Design Thinking, and they're using the colourful blocks to design a prototype. It represents policy reform ideas around transitioning from informal to formal economies. It's a complex system represented with very basic materials. This is design thinking in action: human-centred, problem solving activities that ground design thinking in practice. It helps students to understand and innovatively solve challenges. Design thinking can be used very successfully as an academic programme that goes beyond traditional university practices. It allows universities to prepare a more resilient, adaptive student cohort. These graduates are more competent to enter economies that are constantly changing. This is particularly important when higher education institutions are training students for jobs that might not yet exist or that might have changed or become redundant by the time they graduate. We're living in a time of rapid transformation in terms of what's required for a country's workforce. As the World Economic Form has put it: five years from now, over one third of skills (35%) that are considered important in today's workforce will have changed. Design thinking programmes that nurture both creativity and critical thinking around complex challenges offer students an opportunity to develop core skills for the workplace of the fourth industrial revolution. There's a major skills mismatch between graduates and the workplace in South Africa. A 2016 report identified three areas in which these mismatches exist: demand mismatch (s kills gap between existing education and emergent job needs); education supply (producing fewer graduate s than a field requires), and qualification-job (people moving into fields different from what they have studied for). Higher education institutions need to improve their academic responsiveness to increasingly complex labour market needs and industry requirements. They must also develop graduates with more entrepreneurial mindsets. Design thinking is a very new addition to the country's higher education landscape. But early indications suggest that it might provide some of the tools to help universities in these tasks. I lecture and manage the academic programmes at the Hasso Plattner Institute, which we call "the d-school". It is only the third Institute of Design Thinking in the world and, having opened its doors in 2016, is the newest. The others are at Stanford University in the US and Germany's Potsdam University. Both are more than a decade old and have brought academic rigour to design-led innovation practice. They also make training programmes in design thinking available to academic scholars and leaders in the private and public sectors. Our aim at UCT's d-school is to better prepare students for a changing workplace by nurturing design thinking mindsets. These approaches facilitate students’ readiness for the working world. This is done by exposing them to a variety of mindsets and world views through interdisciplinary, peer-to-peer learning. Students are also given a better understanding of contextual issues through exposure to various lived realities. For example, if a project focuses on exploring informal economies, students will actually get out of the classroom and into the spaces these economies occupy. They talk to informal traders and spend time observing their day to day activities. THAT'S NOT JUST LEGO: IT’S A COMPLEX SYSTEM TAKING SIMPLE SHAPE. Importantly, they're also immersed in the labour market's emerging realities through embedded applications of knowledge in real world projects. Students are introduced to a rich blend of governmental, industry, academic and social challenges. They navigate these, building internal and external understanding of business practice and human relationships. These partnerships with business, government and academia are centred on real challenges. And they have a dual purpose. Students get workplace experience, which can ease their transition from university to the job market. Employers can also foster working relationships with possible future employees. Graduates for the future Design thinking aims to improve students' empathy, their comfort with ambiguity and their ability to resolve conflicting ideas through solutions that are stronger than individual ideas. Students are also equipped with the ability to produce new knowledge through creative mental leaps. One student project involved reimagining banking services that embrace informal economic requirements. The project also looked at how social capital can lead to financial capital. Another project was for a small business called Rent-my-Ride, which offers an online peer-to-peer car rental platform. The students designed a secondary platform that would support small business development among car owners. Yet another project, for Transport Cape Town, saw students developing a social network platform that would support community input in the redesign of transport nodes. The field of design thinking does not lay claim to inventing these new educational approaches. But it does present a cohesive methodology through which to explore them, and to prepare graduates for a world that's changing all the time.